The US is heavily dependent on its transportation system for the quick and efficient movement of goods, people, and military assets. While the bulk of traffic volume utilizes state routes, agricultural industries are dependent on both the state and local systems. The more than 4,000 load-restricted (i.e., posted) bridges on the secondary road system represent potential reductions in the efficiency of the movement of farm goods. This has the potential to reduce the cost-competitiveness of the US agricultural industry. In general, bridge engineers rely on theoretical analyses based on codified approaches. While these techniques provide reliable means for assessing the safe load-carrying capacity, they are, by their very nature, sometimes conservative. By no fault of their own, codified approaches must be widely applicable and, as a result, many assumptions must be made. Another approach is to create an analytical model that represents the behavior of a specific bridge–not a code-specified, generic bridge. 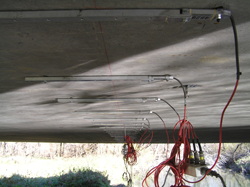 In early 2000, the Iowa Highway Research Board and the Iowa State University Bridge Engineering Center embarked on a project to enhance the bridge assessment capabilities of the state. To do this, they invested in bridge load testing hardware and software. Since that time, the load testing program in the state has become quite mature. Currently, the Iowa Department of Transportation (DOT) Office of Bridges and Structures identifies structures to be tested and is responsible for determining capacities and ratings based upon the load test results. In addition to determining ratings, the Iowa DOT uses data from load tests to aid in permitting super loads and to resolve design questions. 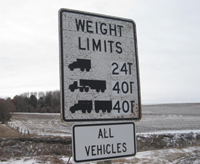 Several counties across the state have utilized the same approaches to evaluate the need for load restrictions. Generally, the first step in the load testing process is to design an instrumentation scheme. The instrumentation plan should strategically place sensors in areas that may impact subsequent analyses. Commonly, the instrumentation scheme is established to answer questions related to end restraint, level of composite action, lateral live load distribution characteristics, and other important attributes. Testing is then completed by installing the pre-designed instrumentation plan and monitoring the performance of the bridge as a controlled load crosses the bridge. Bridge Engineering Center (BEC) engineers then evaluate the data and extract vital information that aids in the creation of a modified load rating. In many cases, basic modification to codified parameters allows Iowa DOT engineers to arrive at a reasonable solution. In other cases, BEC engineers create and calibrate a more elaborate finite element model using the field test data. This calibrated model is then used for direct calculation of an updated bridge rating. The objectives of this work are to demonstrate the capabilities for load testing bridges in Iowa, study the economic benefit of performing such testing, and perform outreach to local, state, and national engineers on the topic of bridge load testing/rating.